Containment Trays can be added to any portable restroom including the basic restroom, standard restroom and deluxe restroom models. 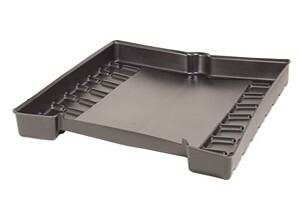 These heavy duty plastic trays are placed under your restroom and act as a drip tray for any run-offs or leaks that may occur. Any fluids that may leak will conveniently drain towards the rear of the tray to a pump out location for our service technician to remove when servicing. A deep end sump allows for easy pump out when our technicians are servicing your portable restroom. Each containment trays meets most federal, state and local codes that require procedures or practices to minimize the discharge of pollutants from equipment. Our containment trays are just one of Event Solution’s many added accessories available to ensure you receive the best experience from your portable toilet rental.